Microsoft just released a patch for Windows XP that fixes a file sharing flaw being exploited by the WannaCry ransomware. Here's how to install it. You can download some versions of the patch using links at the bottom of this May 12th Microsoft article: Customer Guidance for WannaCrypt attacks. The full list of patch variants, including languages other than English, is in the Windows Catalog, just search for KB4012598. I know, its looks like malware itself. The file is small, only 665K. Logon as an Administrator and, for good luck, make a Restore Point first thing. To see if System Restore is enabled, right click on My Computer, get the Properties and go to the System Restore tab. To actually make the Restore Point, go to Start -> Programs -> Accessories -> System Tools -> System Restore. 3. Installing the patch takes only a few seconds, even on old hardware. It first asks you to wait while it "inspects your current configuration, archives your current files and updates your files." Then it makes a restore point. After rebooting, you can verify that the patch was correctly installed using Add or Remove Programs in the Control Panel. You first need to turn on the checkbox to "Show updates." Then scroll down looking for the "Windows XP - Software updates" section. It should be huge. 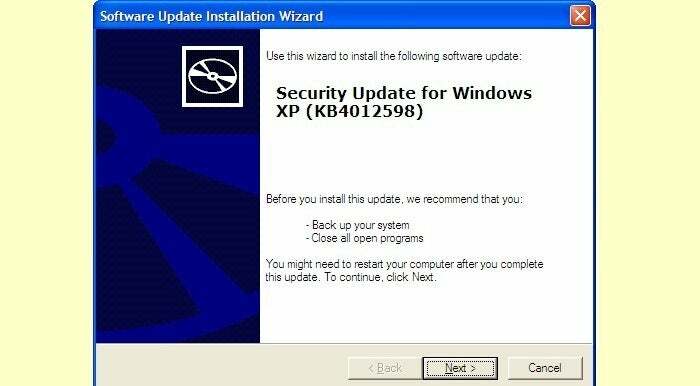 In this section, look for "Security Update for Windows XP (KB4012598)" with the current date as the date installed (see above). Considering this is Windows XP, the installation date should stick out like a sore thumb. On two machines that I tested, it was, fortunately, the last entry in the list. The fix applies to the file sharing component of Windows (Server Message Block or SMB) and thus prevents an XP machine from being infected over a LAN (Local Area Network). However, it would not protect an XP machine that was attacked another way, via email, for example. I checked around (here and here) and Microsoft has not issued an update to their free anti-malware software, Security Essentials, for Windows XP. When XP went off support, it was denied access to Security Essentials. Thus, XP machines remain vulnerable to WannaCry, just not via file sharing on a LAN. To fully protect an XP machine requires a third party antivirus product. Lotsa luck with that. BitDefender bragged today that they can protect against WannaCry, but they do not support Windows XP (see below for update). 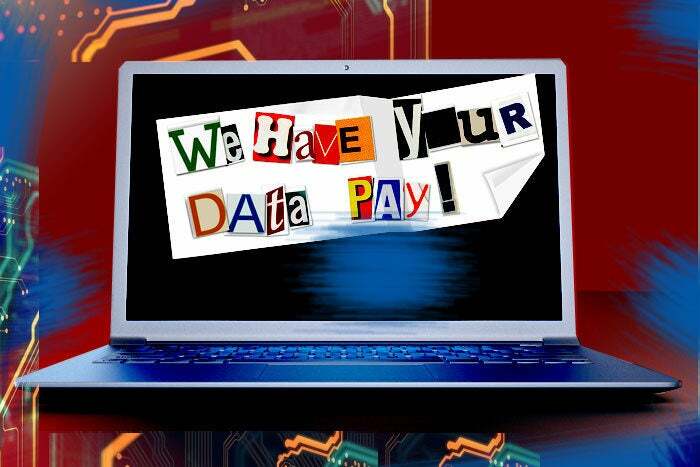 Neither does Avira, Trend Micro or F-Secure. Kaspersky still supports XP, but their website says nothing about WannaCry. So, yes, Microsoft released a patch for Windows XP. But now you know the rest of the story. UPDATE: May 15, 2017. A reader was nice enough to point out that Bitdefender does offer a product that supports Windows XP (and Vista too). The name is fairly direct: Security for XP and Vista. UPDATE: May 15, 2017. A couple people have told me that when they verified the installation of the patch, the install date was not the current date but tomorrows date. Beats me why.